Installerstore Lazy Days of Summer Sale! Take 10% off over 20+ styles of registers and grilles! 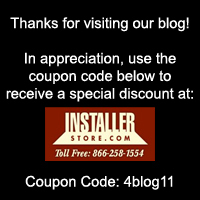 Find the registers you’ve been searching for at Installerstore.com and SAVE!!! NO COUPON CODE NEEDED! Discount automatically applied during checkout! Sale items include baseboard registers, wall/ceiling registers, floor registers, wood registers, and much much more! See website for full list of sale items! !